It feels like summer is barely here and I'm seeing sales on autumn flights. I guess they are hinting that I should have already got my summer plans figured out. Way to be passive agressive Southwest. Anyway, you don't care about my problems - you want to hear about the sale. 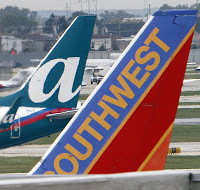 Southwest (and sister company AirTran) just released a huge three-day sale with discounts on all their routes, starting at $49 one way. There are well over 100 cities and thousands of city pair routes to choose from so I'm can't list them all here. Just go to their sites and select your city from the menu to see where you're going next. Travel is valid from August 26-December 18, but not valid for Friday or Sunday flights. Do what I do and fly on a Saturday morning (nobody at the airport) and come back early on Monday so you don't miss work. Click here to view the sale at Southwest Airlines. Click here t to view the sale at AirTran Airways.